The Mizoroki-Heck reaction, commonly known as the Heck reaction, is the palladium-catalysed addition of aryl, vinyl, or substituted vinyl groups to organic halides or triflates. 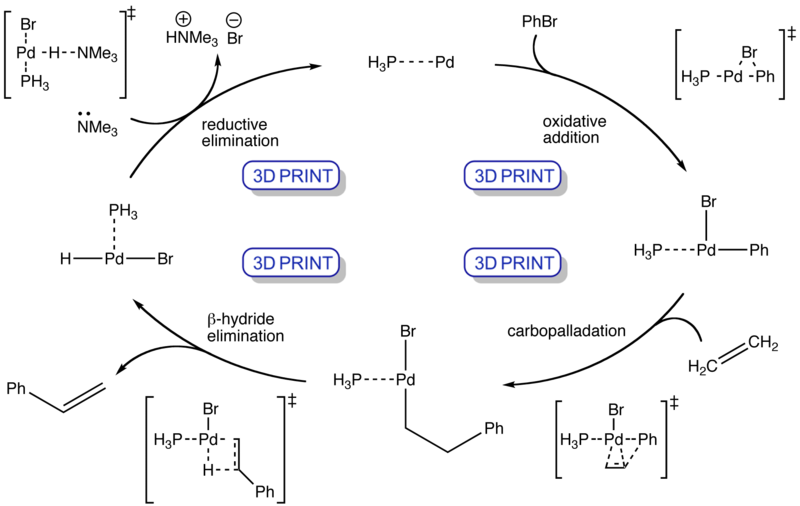 The mechanism involves the oxidative addition of the halide, migratory insertion (or carbopalladation) of the olefin, and β-hydride elimination to form the product. The palladium(0) catalyst is then regenerated using a base in the reductive elimination step. Animations based on P. Surawatanawong, Y. Fan, M.B. Hall, J. Organomet. Chem. 693 (2008) 1552-1563. I. P. Beletskaya and A. V. Cheprakov, Chem. Rev., 2000, 100, 3009–3066.